Colors The color category carries a wide variety of color applications, from pre-measured color packs to 6 sack Transit mix bags. 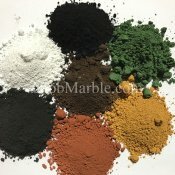 The large bags can be purchased to measure individually the color you desire for a countertop or vertical stamping mix for example rather than using the color packs. These are high quality colors and are available for pick up or shipping. Many colors are stocked randomly and quantities are not consistent so leave enough time for shipments to arrive. We do not use site mixed granular colors since these are problematic with color streaking especially in interior pre-cast. 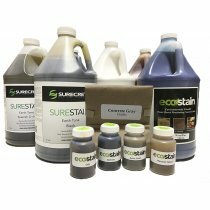 Concrete Acid Stain from SureCrete - SureStain Acid Stain Concrete (reactive acid) Stain comes..
Water-Based Concrete Stain-Eco-Stain Semi-transparent Concrete Stain from SureCrete (10.. Colored Concrete Countertop Veining Mix For Casting from SureCreteXS concrete veining material&.. Concrete Accent Color Water Based Stain Environmentally Friendly	Powder Highlighter	Concrete ..
Ready Mix Concrete Pigments - 10-pound concrete colors bags provide the contractor with a light..
Color Concrete Hardener Pail (63 lb / 28.6 kg) from SureCrete	DESCRIPTION SureCrete'..
Integral Color - Fresh Concrete Color Powder	Integrating custom blends of aggregates to the con..